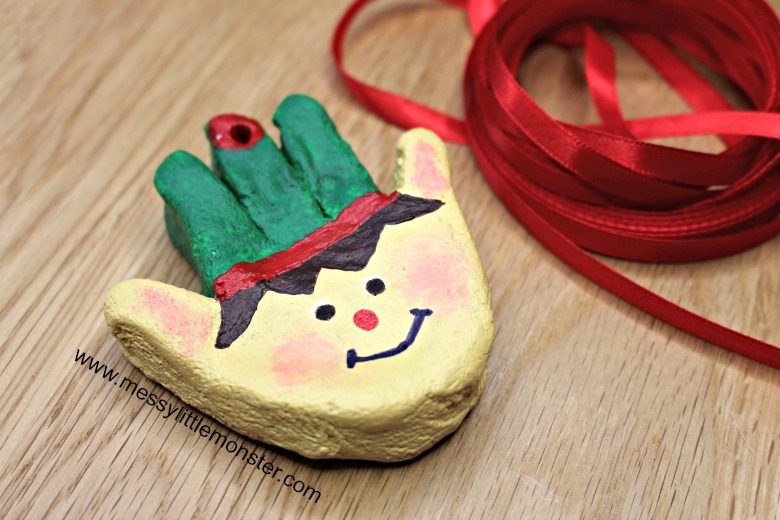 Salt dough handprint ornaments - The cutest elf craft ever! 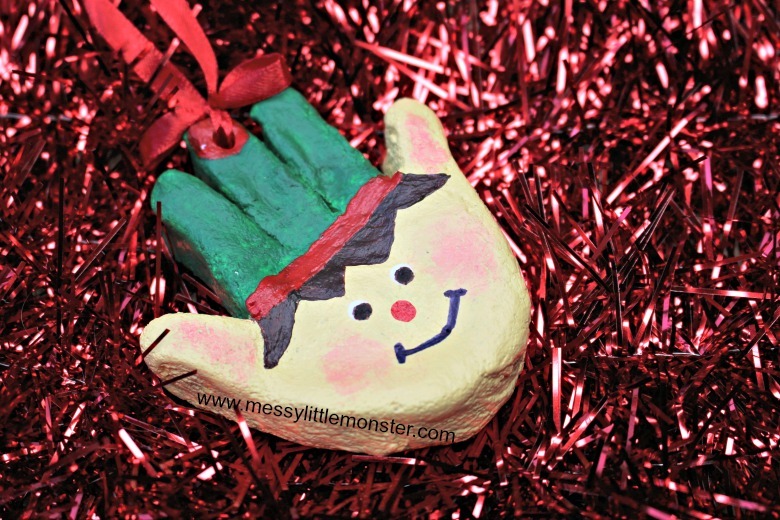 You are going to LOVE this adorable Christmas elf craft made from a toddler or baby handprint! Using our easy salt dough recipe you can make these salt dough handprint ornaments using just 3 ingredients that you are sure to already have in your house! 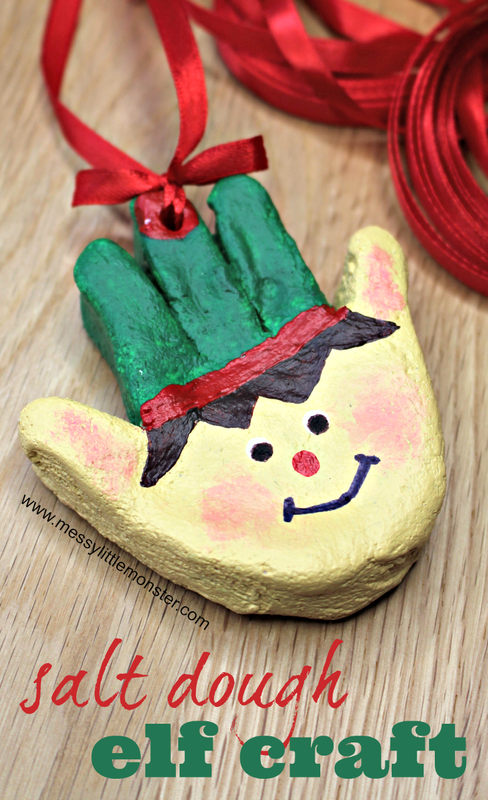 Salt dough crafts are fun and easy to make and salt dough ornaments like this elf ornament look adorable hanging on the tree as well as being keepsakes to treasure forever. Scroll down below for our easy step by step instructions for making these salt dough handprint ornaments. We love salt dough handprint ornaments and have several more designs that you might like to look at in our collection of salt dough ornaments. My personal favourite (as well as the elf craft we are sharing today) is our salt dough santa handprint, but I also think that you will love our most recent handprint ornament, our salt dough penguin handprints. 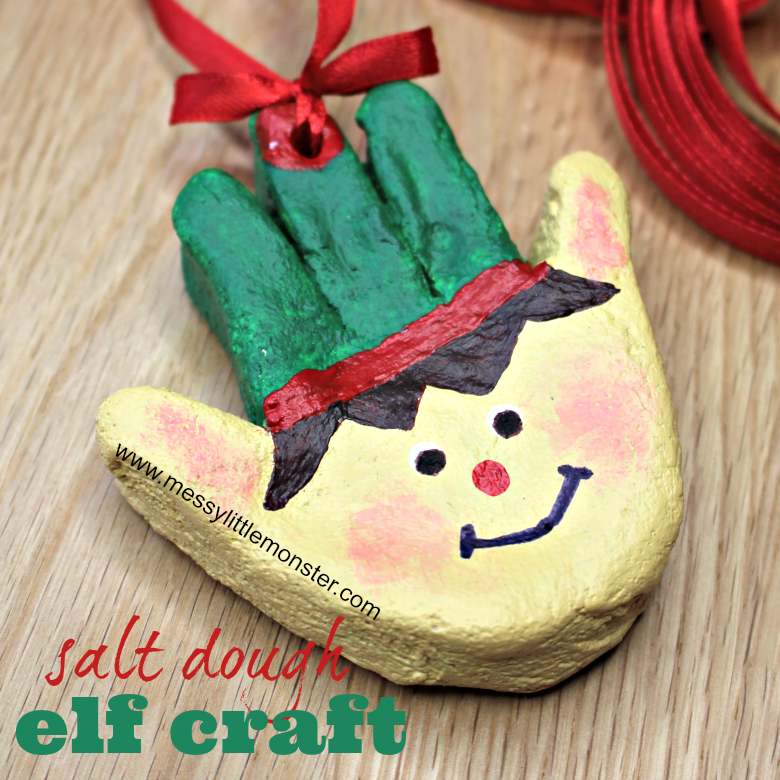 Below we have added instructions for making salt dough as well as how to use it to make a salt dough elf ornament. 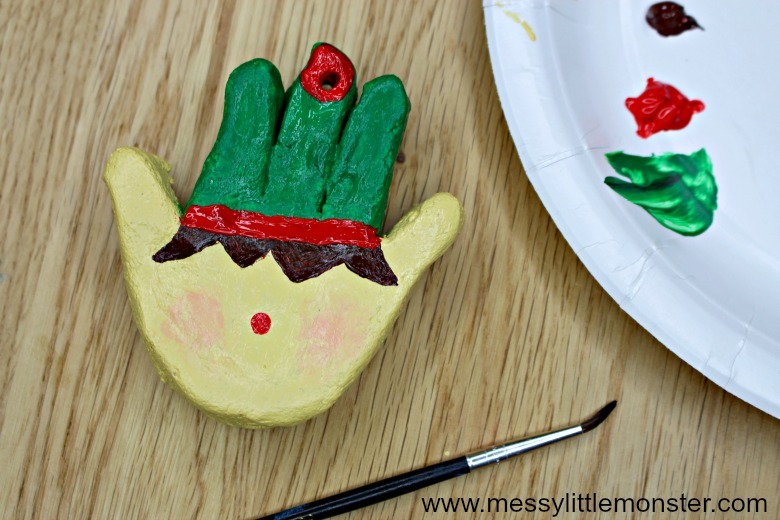 If you are looking for more elf crafts check out our elf on the shelf craft. If you want to make a salt dough elf ornament that looks like your elf on the shelf you can easily change the colours of the elfs hat, skin, hair and eyes! Making salt dough is so easy! Simply mix 2 cups of plain flour (all purpose flour) and 1 cup of salt together in a large bowl and then add 1 cup of water. Mix the ingredients together and knead the mixture into a dough. Follow the simple recipe above to make a batch of salt dough. 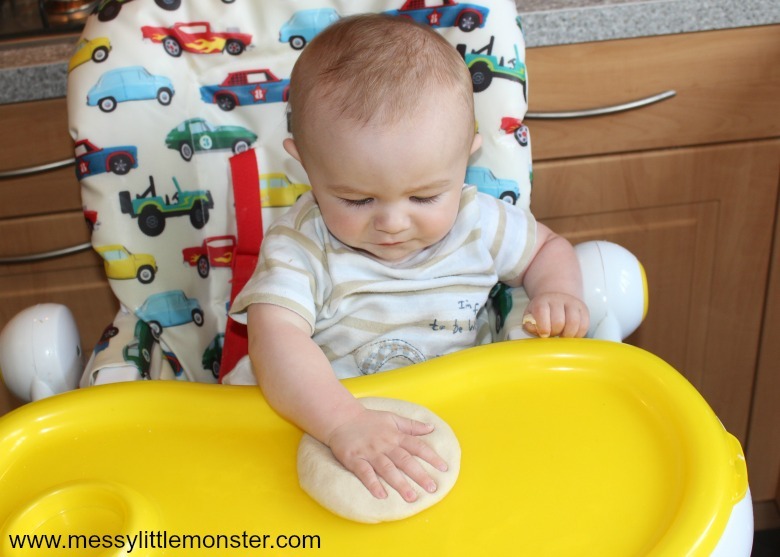 Once you are happy with the consistency of your salt dough roll it into a ball and flatten it slightly before helping your baby or toddler press their hand into the salt dough. Make sure each finger is pressed into the salt dough firmly. I would recommed using acrylic paint to paint your salt dough ornaments. Begin by painting the palm of the handprint in a flesh colour and then paint the fingers green (this will become the hat). Once the flesh colour has dried paint on some hair. Add a painted pom pom and red trim to the elfs hat and use the end of a paintbrush dipped in red paint to make the elfs nose. If you want rosey cheeks add a tiny bit of pink paint to your elf's cheeks and dab it with a dry paintbrush. The easiest way to add a smile to your elf is to use a marker pen. Make the white of the eyes by dipping the end of a paintbrush in white paint and then onto the handprint, once dry draw the coloured part of the eye on using a marker pen. If you want your salt dough craft to last through the years I would recommend sealing it so no moisture can get into the salt dough and ruin it. You could paint on mod podge all in one glue and sealer or use a spray sealer. Leave the sealer to dry (this can take several hours depending on the sealer used). Thread a piece of ribbon through the hole at the top of your elfs hat. 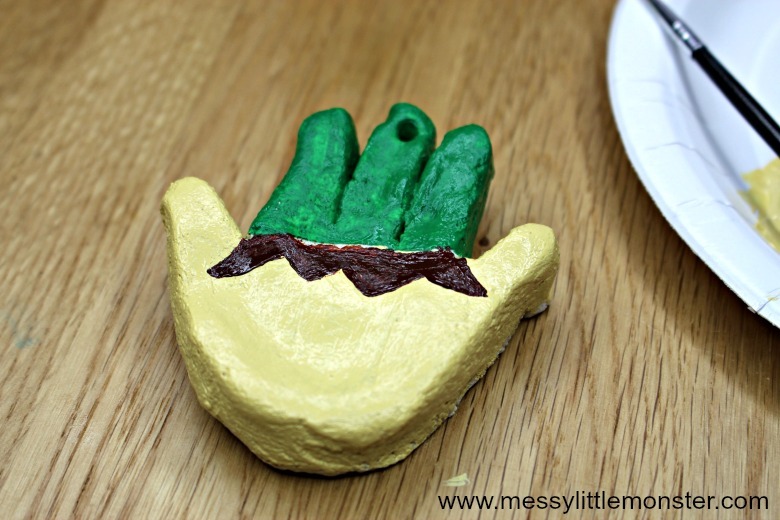 Your salt dough handprint ornament is now ready for hanging! 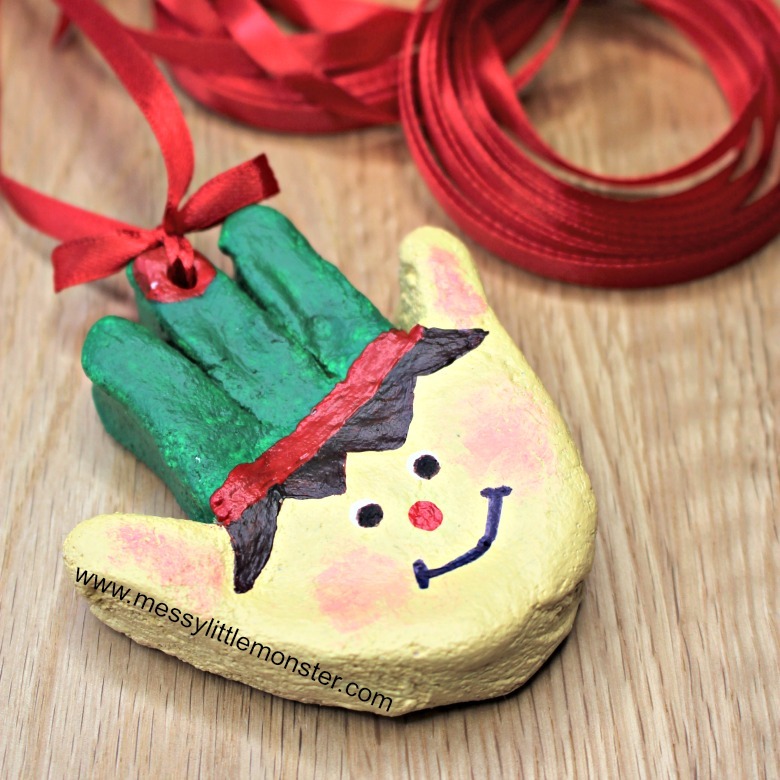 We hope that you have fun making these salt dough handprint ornaments and that this Christmas elf craft is something that you can treasure for years to come! 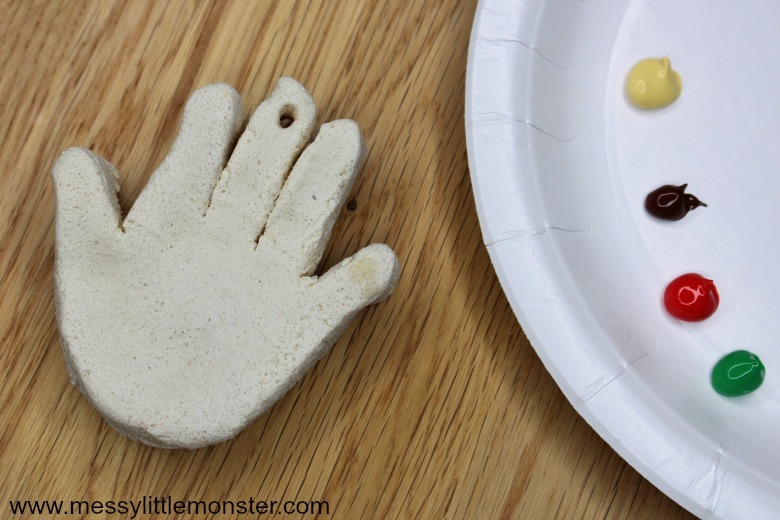 Whether you used a baby handprint or you made this easy salt dough craft with a toddler, it is sure to look adorable hanging on the Christmas tree. Don't forget to take a look at our other salt dough ornaments.